Tired of choking down the same old bland foods? Avoid dietary boredom by adding seasonings that offer more than just good taste. Watch any bad TV sitcom where someone is trying to make the switch to eating healthy, and the jokes practically write themselves. At the start of the episode, the characters are sadly eyeing rice cakes and unseasoned steamed veggies. By the time the closing credits roll, they're gleefully scarfing banana splits in the linen closet. There's a lesson here. If your idea of "clean eating" is to eat the same few things over and over, you're setting yourself up to fail. Dietary boredom is a real threat to your health and fitness goals. So, if you have limited skills in the kitchen, how do you avoid getting in a rut? It's simple: Learn to season! Spices and seasonings are an excellent way to jazz up a dull menu and provide the body with myriad health benefits. Best of all, they're nearly calorie-free, which means you can experiment and add them at your leisure. Just one tip to start off: If your spice rack has been gathering dust for the last few years, dump those relics and buy some new ones. Spices lose potency over time, so the difference is definitely one you can taste! 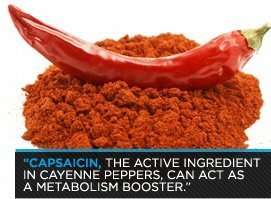 Cayenne peppers have received some big press in recent years due to claims that their active ingredient capsaicin—the same substance that gives self-defense sprays their punch—can act as a metabolism booster. It's showing up in an increasing number of thermogenics and topical painkillers, but as any teenager knows, the best way to experience hot pepper is in your food! Aside from giving depth and kick to otherwise bland dishes, the heat from spicy sauces can work as an effective appetite suppressant. One study found that people who doused their grub with condiments containing capsaicin ate on average 200 calories fewer than those other wimps—er, people who didn't use hot sauce. Researchers have yet to discover all the benefits that cayenne pepper has, but there are indications it can help support cardiovascular health and perhaps even interfere with cancerous cells in the prostate. If you're a fan of hot sauces, you already probably have some capsaicin in your diet. However, cayenne pepper powder is also worth trying. It can add a subtle, pervasive heat to almost any warm dish. You may not feel it at first, but you'll be sweating by the end! A clove a day keeps vampires at bay. What, you need another reason to eat garlic? Well, there are plenty! To start, garlic has powerful antibacterial, antifungal, and antiviral properties. It can reduce bodily inflammation and has been connected to decreases in blood pressure in some studies. A study in 2007 showed that eating garlic boosts the body's supply of hydrogen sulfide, a powerful antioxidant that also increases blood flow. Hydrogen sulfide isn't found in many other foods, which is one reason why many people embrace a garlicky diet as part of their plan to prevent cancer and heart disease. Garlic as a spice—i.e., dried garlic flakes or garlic powder—serves in a pinch, but there's nothing like a real clove for either flavor or health. This is because most of garlic's health benefits come from allicin, a compound which is formed when you smash or cut—or chew, if you're crazy like that—raw garlic cloves. It's present in garlic supplements as well, but not in garlic powder. 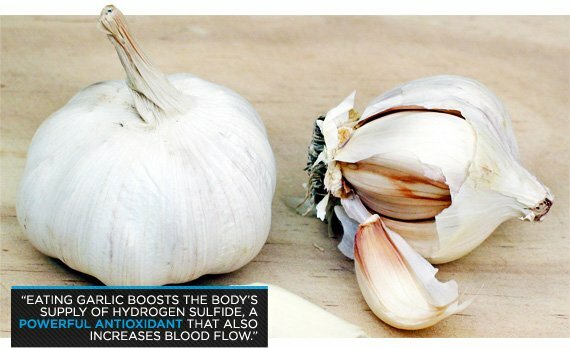 Does that mean garlic powder is useless? No, it's still a powerful antioxidant, but definitely not a superfood like an au natural bulb. Here's a conversation starter to bring to your next dinner party: Despite what you may have heard, cooked garlic actually does have the same powerful cancer-prevention capability as raw garlic—as long as you know how to prepare it. When you cook garlic immediately after chopping or smashing it, the cancer-preventing allicin don't have the chance to get formed. So the key is to let the chopped garlic stand for at least 10 minutes, but as long as 45 minutes if you can, before cooking it. There's no need to thank me—especially with that garlic breath you're rocking! Just because you don't scarf down cinnamon rolls for breakfast anymore doesn't mean you should boot their namesake spice! 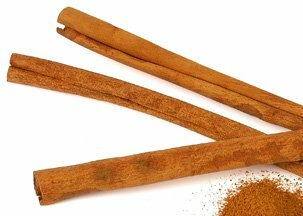 Aside from being a bona fide superfood—meaning, it's good for you in so many ways, we can't fit them in a single article—cinnamon is a versatile spice that adds depth and flavor to both sweet and savory dishes. Where to start with the benefits of cinnamon? It's a natural antibacterial and food preservative, meaning it can help to block bacterial growth and food spoilage. Several studies have suggested that it can lower LDL cholesterol and help regulate blood sugar for people with type 2 diabetes. One study found that, after taking just a half-teaspoon of cinnamon each morning, arthritis patients experienced significant pain relief within a matter of days. It's an effective anti-coagulant, boosts cognitive function, and, oh yeah—it's been shown to reduce the proliferation of leukemia and lymphoma cancer cells. If you're looking to reap the health benefits of this ancient spice, it's worth the time and expense to track down "true cinnamon," or Ceylon cinnamon, which is what is used in the studies. Standard generic cinnamon is often made of another plant, cassia, which has some health benefits but not nearly as many as Ceylon cinnamon. You already know that cinnamon is the perfect complement to oatmeal, protein muffins, and your morning coffee. So the time has come to branch out and try it in entrees like stews, chili, roasted vegetables, and on that boring brown rice you choke down at lunch. You won't regret it! Some people will simply always hate the flavor of cilantro. This isn't just a matter of taste; in fact, researchers have found that some of us have a genetic predisposition that makes the plant taste like soap. For the rest of us, it's a crucial flavor that guacamole and Thai cooking simply wouldn't be complete without. Whichever side you come down on, the health potential of the leaves of the coriander plant are undeniable. Like cinnamon, it's both a powerful anti-inflammatory and a natural food preservative that can guard against salmonella. It can also help to fight off all manners of bodily invaders, from microbial stomach infections to urinary tract infections. In the long-term, it can help reduce cholesterol levels, but on a more general level, it can also reduce nausea, reduce swelling, and decrease the severity of menstrual cramping. 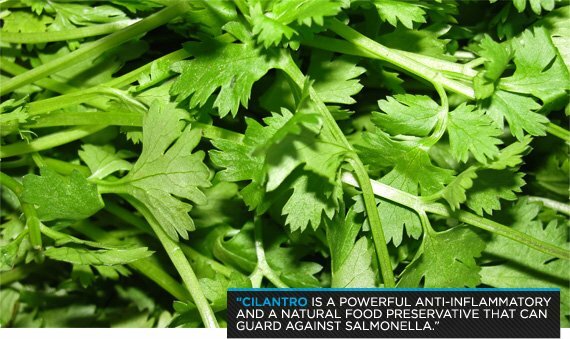 One drawback that keeps cilantro out of many people's kitchens is that the store-bought sprigs often wilt and become slimy seemingly overnight. Luckily, there are several ways to fix this. When you get home from the store, immediately wash your cilantro and wrap the stems in a wet paper towel. This way, they'll keep for well over a week. You can also freeze them, but only after blanching them—boil them for just a few seconds and transfer them to ice water. You could also make and freeze cilantro pesto, or head over to an Asian or Indian grocery store to look for a spicy cilantro chutney. With a seasoning this globally popular, the possibilities are endless! The health benefits of most spices can only be realized in the long-term. In the case of ginger, the help it gives may be one you can feel right away. If you're prone to motion sickness, someone may have suggested ginger pills, tea, or crystallized ginger as a treatment. 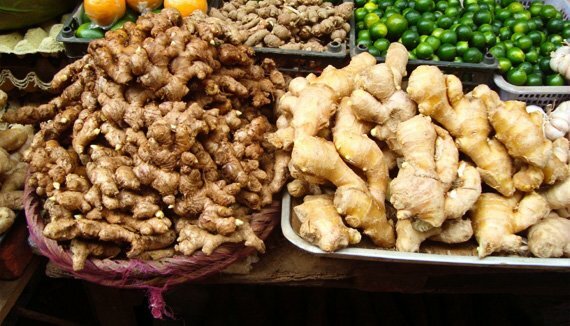 Science has largely backed this up, and more broadly, that ginger is an ace at combating nausea, stomach irritation, and diarrhea. For this reason, it is often suggested to women suffering from morning sickness. Ginger also suppresses the production and synthesis of prostaglandins, hormones that instigate feelings of pain and fevers in the body. This power has led to studies suggesting that ginger can be effective in decreasing the pain caused by menstrual cramps and migraine headaches. Store-bought ginger comes in root form, but you can also buy it as a dried spice or—this is what I recommend—as a paste or puree. It's a welcome addition in any stir-fry, but also works fantastically in marinades for chicken, salmon, pork, or flank steak. Grate it on top of roasted sweet potatoes or oven fries to add a crisp, unique flavor. Or you could try it as the secret ingredient in a salad dressing for something totally new! You know the other spices on this list, even if you didn't know all they can do for you. Now here's one you might have to dig through your spice cupboard to find: turmeric. 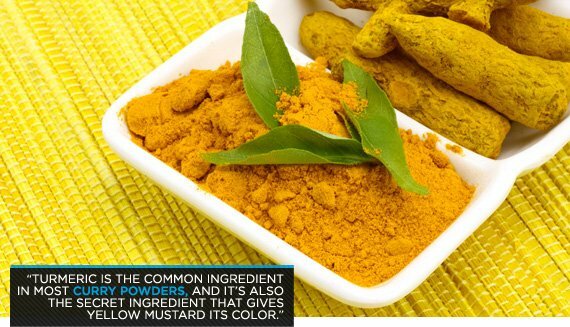 It's a common ingredient in most curry powders, and it's also the secret ingredient that gives yellow mustard its color. But this classic South Asian flavoring has plenty to offer on its own. Turmeric's health appeal focuses on its active ingredient curcumin, a powerful anti-inflammatory that has been at the center of numerous promising clinical trials in recent years. Researchers have surmised it may have the ability to ward off or decrease the symptoms of Alzheimer's, arthritis, chronic kidney disease, and several of the worst types of cancer. The years to come will give us a much better idea of turmeric's powers, but for now, at least consider tossing some in the marinade next time you're grilling meat. One study found that it can significantly reduce the carcinogenic compounds produced when meats are grilled or barbequed, and it's known to be effective against E. coli, a dangerous source of food poisoning.